A magical mouse. 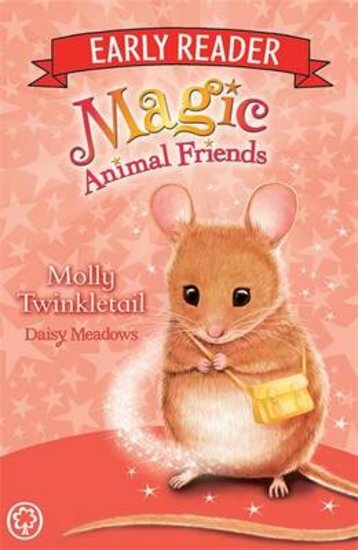 A fairytale forest… This cuddly reader from the author of Rainbow Magic is fantasy gone cute! The adventure begins when best friends Jess and Lily follow a strange golden cat into Friendship Forest. This isn’t your typical woodland walk. The forest is a magical place of adorable talking animals who live in tiny cottages and sip tea at the Toadstool Cafe! In their second cuddly adventure, Lily and Jess have been invited to the forest fair. But Grizelda the wicked witch wants to spoil the fun. Her pesky servants, the Boggits, are causing all sorts of mischief. And now tiny mouse Molly Twinkletail has run away. Why – and where is she hiding? Starting to read has never been so magically cute!